Participants bravely rappelled down the side of the 150-foot tall administrative tower at Garden City’s Nassau Community College to support a great cause. Felicia Brunner of Holbrook getting ready to go "Over The Edge" to support EAC Network. Sarah Muller is a Developing and Marketing Assistant at EAC Network, a non-profit social services organization based out of Hempstead that specializes in the wide variety of services aimed at assisting underprivileged members of the community. Being a non-profit means that EAC Network often needs to rely on the generosity of others to continue their important work; hence, they hold a number of fundraising efforts throughout the year, and their newest – and possibly most thrilling – is Over The Edge, a death-defying challenge where participants who have raised funds for the organization got the opportunity to rappel down the 150-foot administrative tower on the campus of Nassau Community College in Garden City. Over The Edge isn't just the name of the event itself; it's also the name of a for-profit events management company whose specialty is what they call the “urban building rappel.” According to company rep Todd Medeiros, Over The Edge works almost exclusively with non-profit groups looking to raise funds to continue their important civic work. This year's inaugural event was held on Friday, June 30th and Saturday, July 1st, with the first day of the event being a VIP and media-only day; the second day was open to the general public, and attracted approximately 60 people willing to actually climb over the side of a building and slowly work their way down to the ground level via a complex series of pulleys, harnesses, and high-tensile ropes. Speaking of equipment, one thing Over The Edge is known for is their strict adherence to safety standards and ensuring that participants are adequately trained before getting anywhere near the ledge of a building, according to Medeiros. One of the brave souls willing to go through with making like Spider-Man down the side of the Nassau Community College administrative tower on Saturday was Cathy Stanton of Bethpage; although noticeably terrified at the very thought of doing so, she nonetheless bravely pushed on with the rappel, saying that it was worth it for such a good cause. After successfully making her decent to the ground safe and sound, Stanton appeared overjoyed; not only because she was still alive, but also because she had gone above and beyond in the pursuit of her civic duty. 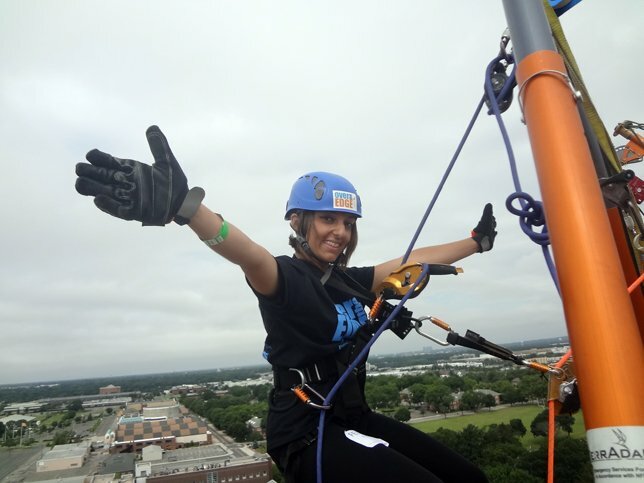 Felicia Brunner of Holbrook is an intern at EAC, and while she has some experience in the realm of extreme sports – including being an avid zip liner – she said she was nonetheless feeling butterflies in her stomach at the prospect of rappelling down the side of a 150-foot tall building. After successfully getting to the bottom of the building without a hitch, Brenner said that the experience was one-of-a-kind and something she would love to do again in the future... especially when it comes to helping out a charitable organization like EAC Network. Subject: LongIsland.com - Your Name sent you Article details of "Local Residents Go “Over The Edge” To Raise Funds for Local Charity EAC Network"